Rhythmic gymnastics is one of the most beautiful sports for girls. Girls who receive training in rhythmic gymnastics develop poise, confidence, and a strong body. It is a sport that combines elements of ballet, gymnastics, dance, and apparatus manipulation. Participants learn leaps, balances, pirouettes (pivots), apparatus handling, flexibility and dance. Rhythmic gymnastics involves a high degree of athletic skill that is learned in a level system of progression as outlined by USAG. Physical abilities needed by a rhythmic gymnast include strength, power, flexibility, agility, dexterity, endurance and hand-eye coordination. 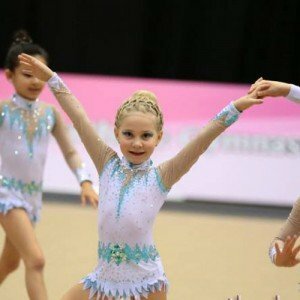 Rhythmic gymnastics training at Vitrychenko Academy is led by Olympic Bronze medalist, Olena Vitrychenko, who shares her Olympic–level of experience and family’s legacy for excellence in the sport. A variety of dance classes such as Jazz, Hip Hop and others are offered to bring variety to elements of dance expression, body movement and musicality in gymnasts and other artistic sports. Classes are led by teachers who are Masters of Sport in dance and rhythmic gymnastics, and who have performed professionally. Sports performance training enhances performance in competition to make young athletes more successful in a chosen sport. It differs from personal training in which the primary goal is usually to improve overall fitness. Our quality strength and conditioning programs take into account the sport that an athlete plays (ie; tennis, rhythmic and artistic gymnastics, figure skating, soccer…) along with individual characteristics such as, age, gender, fitness level and medical history. They are based on sound scientific principles and proven training techniques to create a customized, effective workout plan. Such a program, combined with students own hard work, increases quickness, speed, strength, agility and stamina. Our sports performance training sessions improve vital sport-specific skills, reduces potential for injury, and leads to more confidence and motivation.